For Nicole Talbot, a 16-year-old transgender teen in Massachusetts, a “no” vote on Question 3 in the state’s ballot would mean she loses vital non-discrimination protections in the Bay State. With Sunday marking 50 days until the midterm election, it’s important to remember that a lot is at stake for transgender rights. On Nov. 6, Massachusetts voters will decide the fate of a non-discrimination law that protects transgender people in public spaces. “The law isn’t giving me rights. I had rights before the law existed. It’s just now it’s protecting them, and it’s saying to people you can’t take rights away from me just because you don’t agree with who I am,” Talbot said in an exclusive HRC video. “It’s about me having the right to a restaurant, go shopping, get a coffee - the day-to day life things. Republican Gov. Charlie Baker signed the non-discrimination bill into law in July 2016, and it went into effect in October 2016. Since then, opponents of equality used anti-transgender tactics and messages to get Question 3, which would repeal these non-discrimination protections, on the ballot this election. Anti-equality extremists have sought to scare Massachusetts voters into becoming the first state in the nation to repeal these critical protections, invoking in their campaign a disengous myth around safety in restrooms. A new study from the Williams Institute of UCLA, however, disputed anti-LGBTQ activists’ false, anti-transgender arguments. Talbot said she thinks the best way to ensure Bay Staters affirm transgender equality and fairness is to talk with people in your communities and spread awareness about the importance of the law and why people must vote YES on 3. “I am nervous that the laws will be taken away and my protections will be taken away, but that does not mean that we can’t fight,” Talbot said. Echoing this sentiment was Mimi Lemay, a member of HRC’s Parents for Transgender Equality Council, which is a coalition of the nation’s leading parent-advocates working for equality and fairness for transgender people. 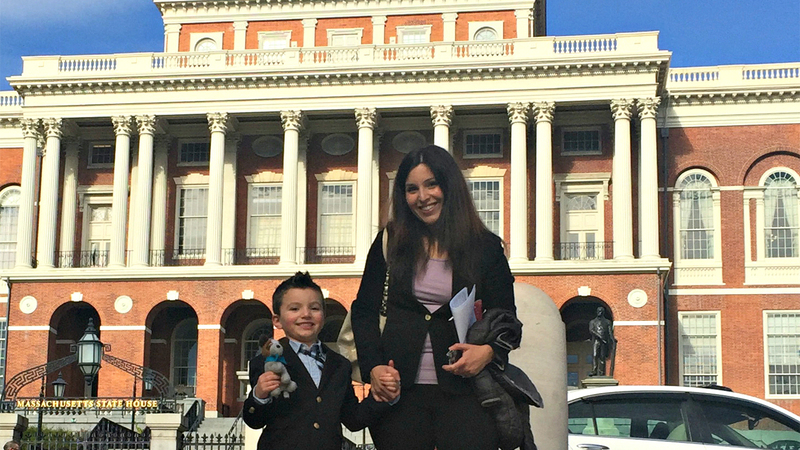 Lemay’s 8-year-old son, Jacob, is among many transgender youth at risk of losing vital protections in Massachusetts if the state’s non-discrimination law is repealed. In an HRC and Freedom for All Massachusetts video, Lemay talked about what it would mean to her family if the law is repealed. HRC calls on Equality Voters to vote YES on 3 and preserve the dignity and respect for transgender Bay Staters like Nicole, Jacob and many others this November. Learn more about the #YesOn3 campaign here.